Lexmarkâ"¢ return program saves the consumer money upfront while also helping recycle old cartridges. Engineered to consistently produce high-quality prints. Created with an intuitive user interface. 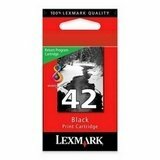 OEM inkjet cartridge for Lexmark? X4850, X4875, X6570, X7550, X9570, X9575, Z1520.